Billings Boats BIL580 Marie Jeanne-Tuna Fish Boat 1/50 scale wood ship kit! Built as the 19th Century was drawing to a close. 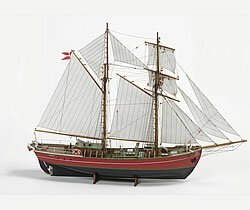 This is a “dundee” of 50-60 tons and equipped with many sails, making necessary a ballast of 20-25 tons and a 12-man crew. Tuna fishing requires robust, seaworthy and relatively fast sailing vessels.